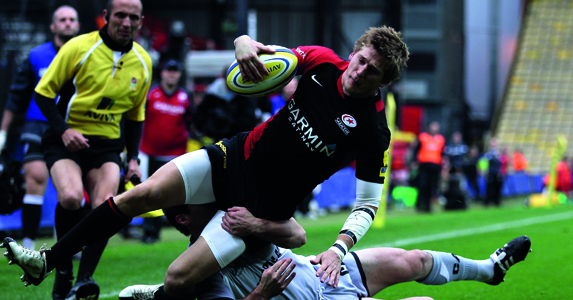 Sunday’s repeat of last season’s Premiership Final between Saracens and Leicester Tigers completed an opening five rounds of ambitious Aviva Premiership Rugby. The total number of tries scored this season has risen to 128, an increase of 52% compared with the same stage of last season and the average number of tries per match now stands at 4.3. This is exactly the same total as after five rounds of the 2007/8 season, widely regarded as the best of recent years. The percentage of matches finishing with one score or less between the teams has been 43%, as the competitiveness and unpredictability of Aviva Premiership Rugby continues. Like-for-like attendances over the opening five rounds are 1% below last year and with the quality of rugby now being played, clubs will be looking to draw in the crowds despite the tough economic times. Leading the individual try scoring statistics are four players each on four tries; Schalk Brits, Scott Hamilton and Topsy Ojo having caught up with early front runner Tom Varndell. All four will look to carry that try scoring form into European fixtures this coming weekend. With all the clubs now heading into Europe, five of the six English clubs in the Heineken Cup are sitting in the top six of Aviva Premiership Rugby. This time last season, only three of the Heineken Cup representatives were in the top half of the table.